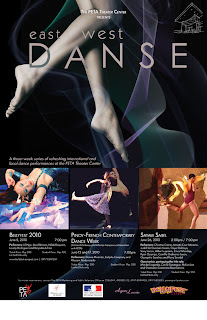 My friend Marella and I saw the Pinoy-French Contemporary Dance Week on June 15. The show featured a dance performance on video by local dancer and choreographer Donna Miranda (although, the video featured two of her students), Lin Yuang Shang and Caroline DesMaison. Donna Miranda's "Anything Less is Less Than a Reckless Act" social experiment featured the choice of a lecture or a video of a boy and a girl moving through each other's bodily loops. We found ourselves being rushed into the theater to see a piece that could have been called "We Fit Together." It was nice and smart. I like how one position could look like a choke hold one moment and tender at the next. It was also too long─moving from "WTF!" to "I did not come here to see this" to "Fine" to "Really cheesy" to "Those young dancers are cute while their eyes are begging the camera man to stop" to something that looked like an Oren Lavie music video, which they should have stuck with. And I wish Donna Miranda had handled the post-performance Q&A better. Lin Yuang Shang then did a solo piece called "Kung Fu Dancing". I liked how he played with light and shadows and film. At one point, he used kung fu movies as his backdrop. Later on, he had a video of the stifling modern city while he kept emphasizing how one must be like the water. I thought he could have done with less textual and verbal cues since his dance and videos were already strong. Marella mentioned that he repeated and broke down the parts of his thesis too much. Caroline DesMaison' performance "Entre Deux" seemed like the most complete and clear performance of the three. (She's in the second picture in the poster.) It didn't require text or visuals or a Q&A or lecture to explain what she was doing. All it was was a woman dancing to music, non-music, silence, and rain with her body trying to escape from itself. Her performance was choreographed by Lin Yung Shang, who founded the Eolipile dance troupe. Of course, the event was sponsored by Slenda, which also has a dance workout video called Slendance.